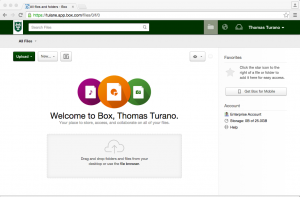 Box.com cloud storage is a robust tool for file storage, sharing and collaboration. The following short-video identifies the top getting started features. Box Inc. is an online file sharing and personal cloud content management service. With your Tulane University credentials, faculty and staff can create an account which will provide you with more than 50GB of free storage. 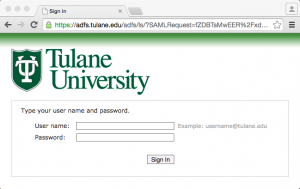 Students do not have access to a Tulane provisioned Box account but may create personal accounts directly with Box. You will be given access to specific department related folders and you can organize your private business content in your own folder tree. When your files are stored in Box you have a quick, easy and secure way to review version history and share your files internally or externally. Are group projects a challenge – not the good kind? Are you bombarded with emails, making it tough to determine the latest file version? 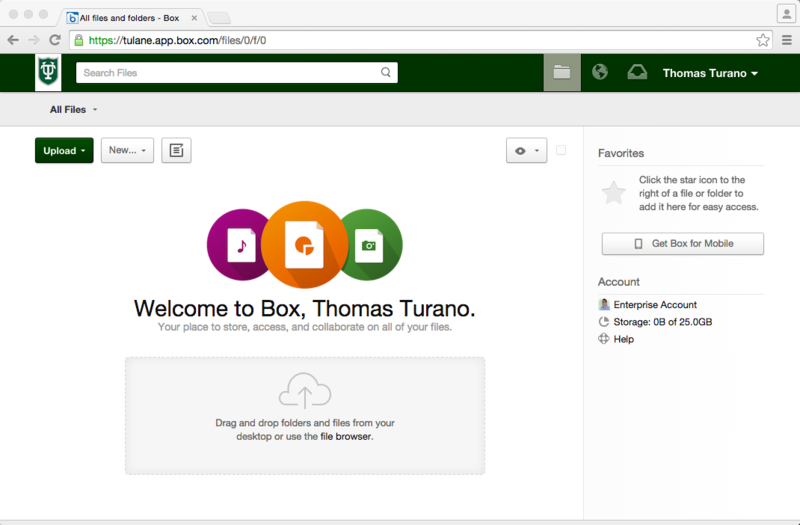 Box allows you to centralize files in a single online workspace. Invite your colleagues or clients to Share and Edit: Turn folders into shared online workspaces, invite people to view, edit and upload files and more. Do you have a client who you need to actively work on a long-term project with? Invite them into a folder to have a lasting working relationship. Learn more about inviting collaborators now. Post Comments and Assign Tasks: Whether you leave a quick comment or you want to assign a task, keep the whole team on track by exchanging feedback in one place. Instead of going back and forth in a long email chain, use comments to maintain the conversation history around your content in a single place. Using box will allow you to share files much larger than what you can with regular email. Replace email attachments by uploading your file to box and sending a url. How do I create a Box.com account? Faculty and Staff can set up a Box account, allowing 50 GB of storage, using Tulane University credentials. 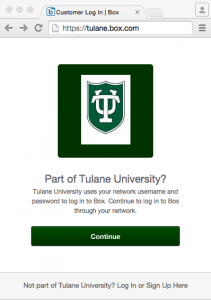 Students do not have access to a Tulane provisioned Box account but may create personal accounts directly with Box. After you sign in, your account will automatically be created. How do I create folders in my Box account? Creating folders is a great way to stay organized when using Box. There is no limit on how many folders you can create in your account. 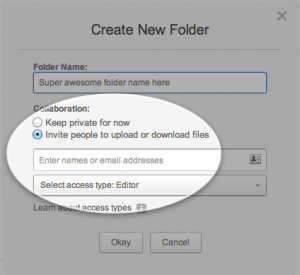 You can create different file types or folders directly from your Box account. Right-click in the Files and Folders screen or select one of the options from the dropdown menu revealed when you click the New button in the top-left corner. Additionally, the folder ownership status is displayed next to each folder icon. Folder ownership is determined by collaborator permission, and access levels. If a collaborated folder is owned by you, Box displays Owner next to the folder icon. If a synced collaborated folder is owned by you, Box displays Owner next to the synced folder icon. For external folders, Box displays the name of the external owner. If the owner is a free user with no enterprise, Box displays Owned externally next to the folder icon. How do I view my Box files and folders in Canvas? Box.com is integrated with the Canvas LMS. The Box tool can be added to your Canvas course to share documents and allow upload/download of course assignments and contents. Users should follow the steps listed below to enable Box access from within Canvas. What file types can be Previewed in the Box viewer window? What files types can be Previewed in the Box Viewer window? Most Office and PDF files can be opened in the Box Viewer. Some files types are viewable in beta mode or must be downloaded before they can be viewed. Click the link below to view the list of file types available in the Sample Preview mode.